JUNEAU, AK– Beer drinkers in Wisconsin will be able to celebrate the Labor Day holiday with brews from the state of 100,000 glaciers when Alaskan Brewing brings their bottled “taste of Alaska” to the Badger State this September. Alaskan Brewing Co. is partnering with six local distributors to help share the products throughout the state. “We are thrilled to represent Alaskan Brewing Co’s award-winning beers in our markets,” says Mike Frank, President of Middleton’s Frank Beer Distributing, one of Alaskan’s Wisconsin partners. With the addition of Wisconsin, Alaskan’s second new market entry since 2008, Alaskan beer will be available in a total of 12 states. Alaskan will be entering Wisconsin with their Gold Rush-era inspired Alaskan Amber. Alaskan IPA and White Ale will be available in mid-September, a number of their year-round and seasonal beers will be available in kegs and caseware in the state later this fall. “Customers have been asking for it and we look forward to selling such great craft beers in our 30th year of business,” says Sussex-based Beer Capitol’s Ken Limas. Alaskan will also be partnering with Lee Beverage, Kay Beer Distributing, CJW Distributing and LaCrosse Beverage. This year the Juneau-based Alaskan Brew Crew celebrates their 25th year of handcrafting award-winning beers brewed with the historic recipes and local ingredients of the Last Frontier. “We are excited to celebrate our anniversary with a hop over the Mississippi to share our beers with Alaskan fans in Wisconsin,” says Alaskan Brewing Co-Founder Marcy Larson. Alaskan Brewing will be posting news and announcements about launch events and activities at Facebook.com/AlaskanBrewingCoWI and AlaskanBeer.com as they get closer to the September release. Alaskan has been brewing in the remote coastal town of Juneau, Alaska for the last 25 incredible years. To celebrate this tradition, the Brew Crew created Alaskan Perseverance Ale; a Russian Imperial Stout brewed with Alaska birch syrup, fireweed honey and alder-smoked malt — a tribute to all that makes Alaskan beers truly Alaskan. 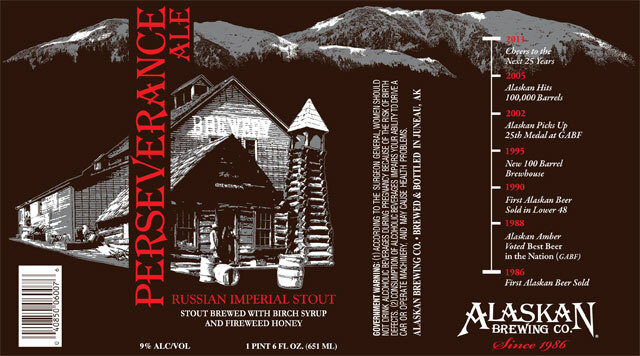 Alaskan Brewing Co. | Perseverance Ale from Redtail Media on Vimeo.